A friend of mine and fellow Jew pointed out to me recently that there are many more African Americans killed annually by the American police than there are Paleistinians killed by “evil, racist Israeli settlers.” He asked me whether I have given up on the U.S. yet. His question prompted the following reflection. The evil racist Israeli settlers are simply manifestations of the much larger evil–the Israeli state imposing a brutal military occupation on 4.5 million Palestinians in the West Bank. It isn’t the settlers who are killing unarmed Palestinian protestors, but Israeli soldiers, who often use live ammunition as a means of crowd control. Palestinians under occupation are subjected to a daily regimen of degradation and harassment. Of course there are some similarities between the situations of Palestinians and African Americans just as there are between the Israeli occupation and South African apartheid. Have I given up on the USA yet? I certainly don’t plan to go live there. I believe there are attractive elements of American culture, as there are of Israeli culture, that aren’t obviated by the crimes of the state. As an expat American, I am appalled by the depth and persistence of American racism. As a Jew, I am appalled by the toxic mix of secular nationalism and religious zealotry that seems to have destroyed the two-state solution and is making the occupation permanent. Most progressive Americans denounce the racism in the U.S. 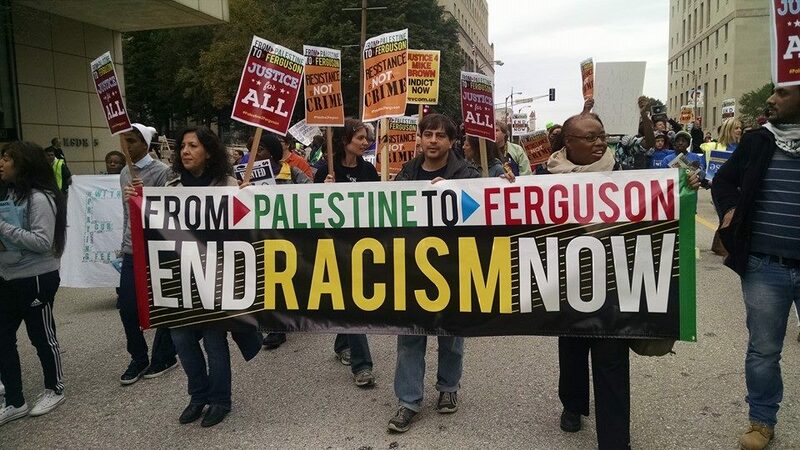 Many progressive Jews engage in apologetics when it comes to the occupation. Jewish tolerance of Israeli crimes is truly depressing. Noam Chomsky has pointed out that the greatest support for Israel comes from the United States. Australia, and Canada, all colonialist settler states that nearly wiped out their indigenous populations. Any honest account of Zionism and the establishment of the Israeli state certainly demonstrates that the vast majority of Palestinians have been innocent victims. That their victimhood doesn’t exactly parallel the victimhood of African Americans doesn’t lessen it in the least. Both Palestinians and African Americans have sometimes turned to violence. To claim that all contemporary African Americans or all Palestinians are nothing but blameless victims is to engage in a romanticizing fantasy that dehumanizes them and is itself a form of racism. But using their imperfection as a reason for not supporting their struggles is disengenuous to say the least.